‘You fail to read this book at your peril’ – Admiral James G Stavridis, US Navy, former Supreme Allied Commander Europe. Closely modelled on his NATO experience of war gaming future conflicts, 2017 War With Russia is a chilling account of where we are heading if we fail to recognise the threat posed by the Russian president. 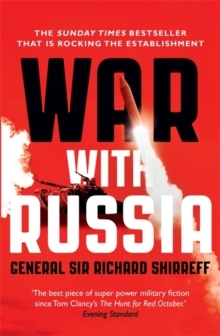 Written by the recently retired Deputy Supreme Allied Commander Europe and endorsed by senior military figures, this book shows how war with Russia could erupt with the bloodiest and most appalling consequences if the necessary steps are not taken urgently.